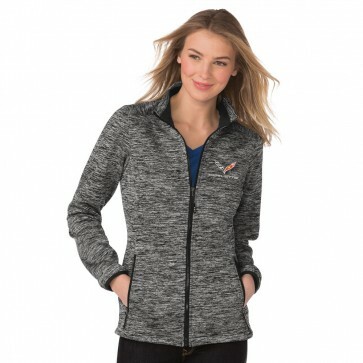 Electric heather pattern adds an athletic look to this soft shell with a warm fleece interior. Gently contoured silhouette, zip-through cadet collar, front zippered pockets, elastic cuffs, adjustable hem with slight drop tail. C7 crossed flags and Corvette signature embroidered on left chest. 100% polyester knit shell and a 100% polyester grid fleece lining. Imported.